Richard Wyckoff’s market cycle laid the foundation for a simple categorization of technical trades into four categories. There are two trend trades: trend trading and counter trend trading, and two support and resistance trades: level holding and level failing. Though this may seem like a useless classification system, it is not. Every technical trade and trading method falls into one of these categories. Some market structures favor certain kinds of plays over others. If you are a trader who trades all categories, you need to apply the right kind of plays to the right market environment. Look briefly at each of the four broad trading methods and ask the following questions from a general notion. Which one of your trading strategies fall into this category? What are the associated probabilities, reward/risk profiles, of these trades? How do these trades fail? 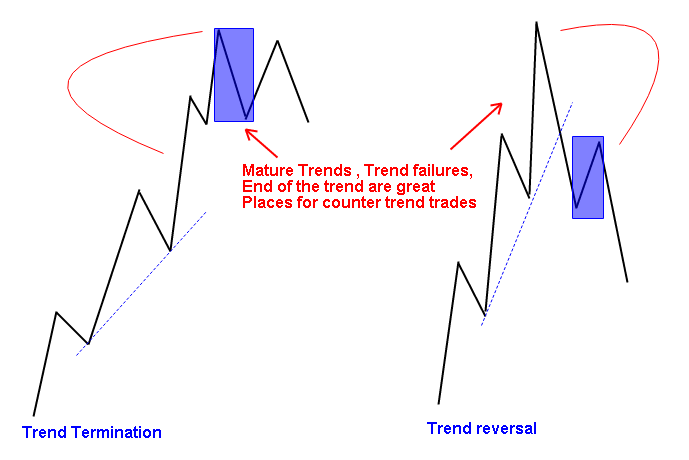 Trend continuation plays are not simply trend plays or with-trend plays. The name implies that we find a market with a trend, whether a nascent trend or an already well established trend, and then we seek to put on plays in the direction of that trend. In the context of our simplified Richard Wyckoff’s cycle, trend continuation trades are most appropriate in markup or markdown, but these early trend trades may be attempted where accumulation breaks into the uptrend or where distribution breaks down into the new downtrend. Trend trading plays tend to be high-probability plays because there is a verifiable, statistical edge for trend following; these plays are aligned with one of the fundamental principles of price behavior. It is important to have both the risk and the expectation of the trade defined before entry; this is an absolute requirement of any specific trade setup, but it can be difficult with trend continuation trades. 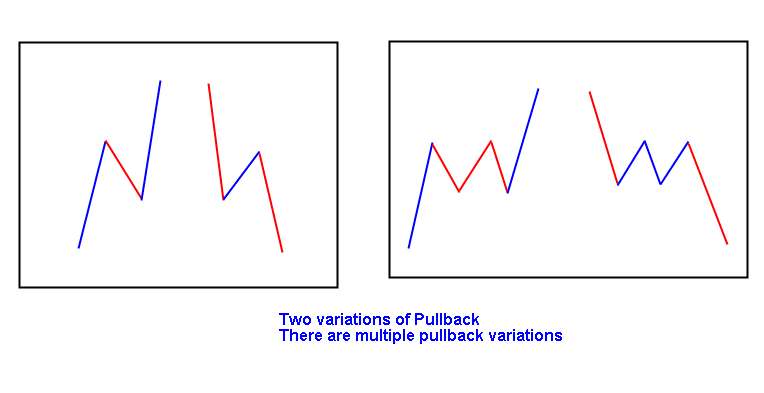 The most common trend trading setup is to use the pullbacks in a trend to position for further trend legs. It is also possible to structure breakout trades that would be with trend plays, and there is another category of trend trading setup—trying to get involved in the very early structure of a new trend. There are always dangers in trend trading, especially when everyone is leaning the same way in a market, and, especially in well-established trends, there are places where many market participants have piled into a very obvious trend continuation play. In these situations, especially in overextended markets, reversals can be dramatic. Some traders might apply a label like “trend reversal” to most of the trades in this category, but this is counterproductive because it fails to precisely define the trader’s expectations. 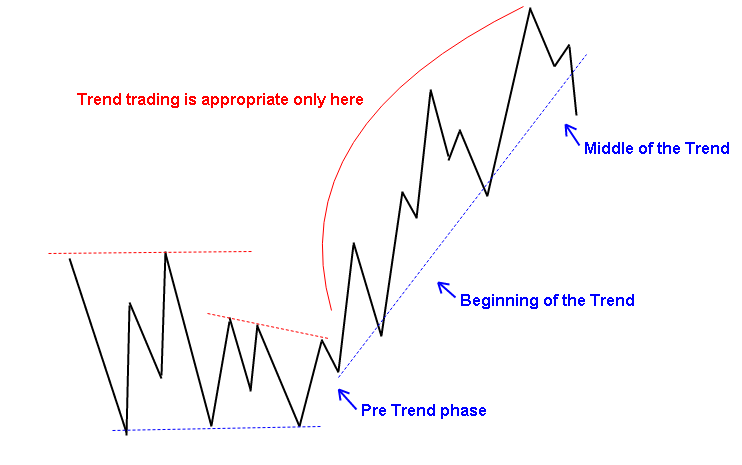 If you think you are trading trend reversal trades, then you expect that a winning trade should roll over into a trend in the opposite direction. This is a true trend reversal, and these spots offer exceptional reward/risk profiles and near-perfect trade location. But, true trend reversals are rare, and it is much more common to sell somewhere near the high and to then see the market stop trending. The obvious spots in the cycle for counter trend trades are where the uptrend stops and moves into distribution, and vice versa on the downside. Counter trend trading setups are not usually high-probability plays, but the compensation is that winning trades tend to offer potential rewards much larger than the initial risk. If your patterns allow you to position short near the absolute high point of a trend leg with some degree of confidence, then you have a well-defined risk point and the potential for outsized profits on these trades. Over a large period; the risk/reward profile may be very good, leading to a solid positive expectancy, even if most of these trades are losers. One common trading setup is fading (going against the trend) these trades offer a very quick and short reversal. For instance, a trader might find spots where the rallies in the uptrend have run up too far too fast, and take short positions against those rallies. Counter trend trades are trend terminative (counter to the existing trend) trades, and trade management is an important issue. Most dramatic trading losses, the kind that blow traders out of the water (and that don’t involve options) come from traders fading trends and adding to those positions as the trend continues to move against them. Iron discipline is required to trade these with any degree of consistency. It is possible to apply trades from these categories in more than one spot in the market structure. We might expect that most support/resistance trades will take place in accumulation or distribution areas while the market chops sideways, but a trader trading with-trend trades could initiate those trades by buying support in the trend. Are these trend following trades or level holding trades? The answer is both. 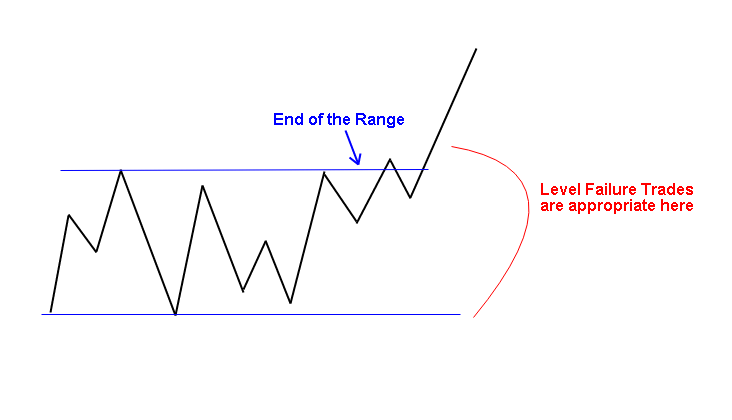 It is easy to find examples of well-defined trading ranges on historical charts where you could buy and risk a very small amount as the market bounces off the price at the bottom of the range. These trades do exist, but they are less practical support holding trades. Support, even when it holds, usually does not hold cleanly. By the time you see the support level is holding the market will already be far from the level, increasing the size of the stop loss needed. Most traders will try to avoid trading in these equilibrium areas, so many support holding trades set up in trading environments. Level holding trades, as a group, tend to have the lowest reward/risk ratios. For the shorter-term trader trading these levels, there are some important issues to consider. Because of these issues, level holding trades are treated with cautiousness. It is worth mentioning that there is a special subset of support/resistance holding trades that actually are very high-probability trades: failed thrust. Remember, when everyone is leaning the wrong way, the potential for dramatic moves increases greatly, and nowhere is that more true than in a failed thrust. Support/resistance Failure trades is the classic breakout or breakout from channel trades and, ideally, would be located at the end of accumulation or distribution phases. In fact, these trades actually define the end of accumulation or distribution, as the support or resistance fails and the market breaks into a trend phase. Another place for support/resistance failure trades is in trends, but many of these are lower time frame breakout entries into the trading time frame trending pattern. Depending on the time frame and intended holding period for the trade, it may be possible to find that there are patterns that precede and set up the best examples of these trades. Many traders, especially day traders, find themselves drawn to these patterns because of the many examples where they work dramatically well. In addition, the actual level failure areas tend to be high-volatility and low-liquidity areas, which can increase the risk in these trades. They occur at very visible chart points, and so they are often very crowded trades. The presence of unusual volume and volatility can create opportunities, but it also creates dangers. Execution skills probably matter here than in any other category of trade, as slippage and thin markets can significantly erode a trader’s edge. These trades can offer outstanding reward/risk profiles, but, especially in short-term trades, it is important to remember that realized losses can sometimes be many multiples of the intended risk. A common setup of this category is breakout. The actual breakout areas tend to be high-volatility and low-liquidity areas, which can increase the risk in these trades. They occur at very visible chart points, and so they are often very crowded trades. Many trading books show example after example of dramatic breakouts, but there is one small problem with breakout trades—most breakouts fail. These four different types of trading style, provide an excellent framework for thinking about technical trades. 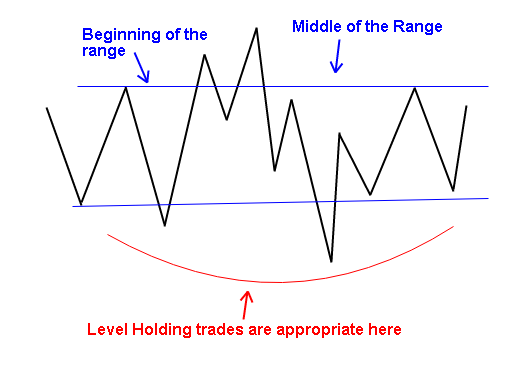 This is a simple, valid, and consistent labeling scheme, and it is nearly impossible to find a technical trade that does not fit within these trading methods. Many trades may fit into more than one, especially when the complexities of multiple time frames are considered, but this does not compromise the practical aspect of the system.